MYJOECARD.COM, LLC is very excited to open the Austin, TX market. MYJOECARD.COM, LLC is proud to have received the 2011 Merit Award in recognition of its contributions to economic development, community service, and leadership in Kansas. This 2009 Award of Merit was presented by Kansas Governor Mark Parkinson, and issued by the State of Kansas and the Kansas Department of Commerce. MYJOECARD.COM, LLC is proud to have received the 2010 Merit Award in recognition of its contributions to economic development, community service, and leadership in Kansas. This 2009 Award of Merit was presented by Kansas Governor Mark Parkinson, and issued by the State of Kansas and the Kansas Department of Commerce. MYJOECARD.COM, LLC is proud to have received the 2009 Merit Award in recognition of its contributions to economic development, community service, and leadership in Kansas. This 2009 Award of Merit was presented by Kansas Governor Mark Parkinson, and issued by the State of Kansas and the Kansas Department of Commerce. MYJOECARD.COM, LLC is proud to have received the 2007 Merit Award for Excellence in Service from the State of Kansas and the Kansas Department of Commerce. 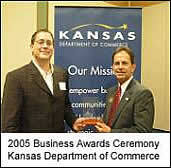 2007 Finalist for Business of the Year, State of Kansas/Kansas Department of Commerce! Business Membership for MyJoeCard tops 100! Response from business members and cardholders in the Denver area residents has been wonderful!